Photo courtesy of Republica de Aca. 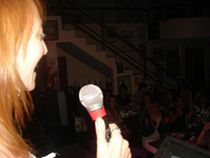 Karaoke bars are called canto bars in Buenos Aires, as the word 'canto' means to sing or singing. You'd be hard pressed to find karaoke in Buenos Aires during the week, but on weekends canto bars open up their doors and ready their stages for some song-time fun. Here are a few. Republica de Aca - This bar has a mix of theatrical draws (live shows, tango, theater)one of which is karaoke. Starting at 9 p.m. on Friday and Saturday nights the stage opens up for groups of singers or that one sole crooner. Karaoke is also scheduled on nights prior to a national holiday. You can reserve a table and request one of three dinner options (from simple pizza to more elegant fare) for the night you plan on visiting. Chess - Karaoke Korean style, in your own private room, er, box. Chess Karaoke Club offers booths for hourly rental where karaoke equipment is set up and friends can sing in front of those who know them best. Chess is located in Bajo Flores (a.k.a. Koreatown), which is known to be a dangerous area. Get a taxi right to the door. Prices start around 40 pesos per hour per room that can fit a dozen people or more.Bring cash and make reservations in advance for weekends. Probar - Opened in 1984, Probar has been offering up thousands of songs for people to sing along to for many years now. Their collection includes songs in several languages and menu offers typical bar food such as pizzas. Sitges - While the rest of the weekend is devoted to a variety of drag shows and other gay friendly parties, on Sunday Sitges offers up karaoke. It has a glad decor, with trippy tear drop light fixtures and images of famous American actresses decorating a wall border. They offer a standard drinks menu. Source: Karaoke. (Spring / Summer 2011/12). TimeOut BA, pg 119.